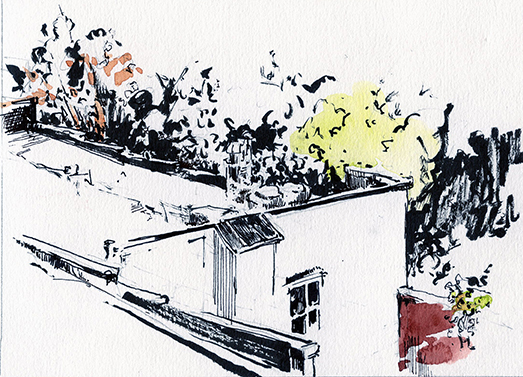 Open Studio tour | Sketching … Always! As I promised, I have finally gotten around to posting some more of the sketches from my recent trip to the Urban Sketchers gathering in Chicago a few weeks ago. This first image was actually done in the morning of the last full day of the symposium. I was on Michigan Avenue just south of the Chicago River watching the morning light and shadows play across the tall buildings across the bridge. Earlier, during in the first full day in Chicago I participated in a session led by Lynne Chapman, an illustrator and urban sketcher from England. Lynn had us concentrate on using line and color separately … finding ways for them to harmonize or counterpoint one another rather than always controlling our color with line. It was an interesting experience; one that I have many times worked on with my adult students in classes … but which I need to remind myself to incorporate often in my own work. For our first exercise we glued down several pieces of arbitrarily shaped pieces of color paper onto to our sheets of watercolor paper. 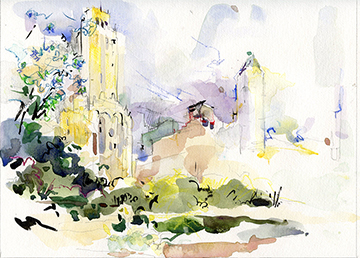 Then, using inks and other materials (I chose to use dry color marks made with Caran d’Ache watercolor leads), we drew a view of the skyline across Michigan Avenue. Here is my 2nd exercise piece from that session. I had lots of fun with this … it felt good to be back in “student” mode a bit, It resonated with how I imagine my adult student feel when I push them to try a new type of project. After several more related exercises, we all went off to try and incorporate some of this idea into a piece on our own. 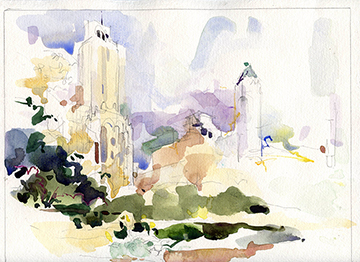 I worked up a watercolor sketch using a different part of that skyline viewed through some of the bushes and trees of the arboretum in Grant Park. I worked very loosely, applying color and lines … sometimes together, often separately; trying to define forms using both line and color … but rarely directly conjoining the linear and color shapes. One of the last pieces of my time in Chicago was again down along the river on Michigan Avenue. This one is in some ways my least successful piece of the symposium. I was working on a large-ish (1/4 sheet, 7.5 x 11) watercolor paper. 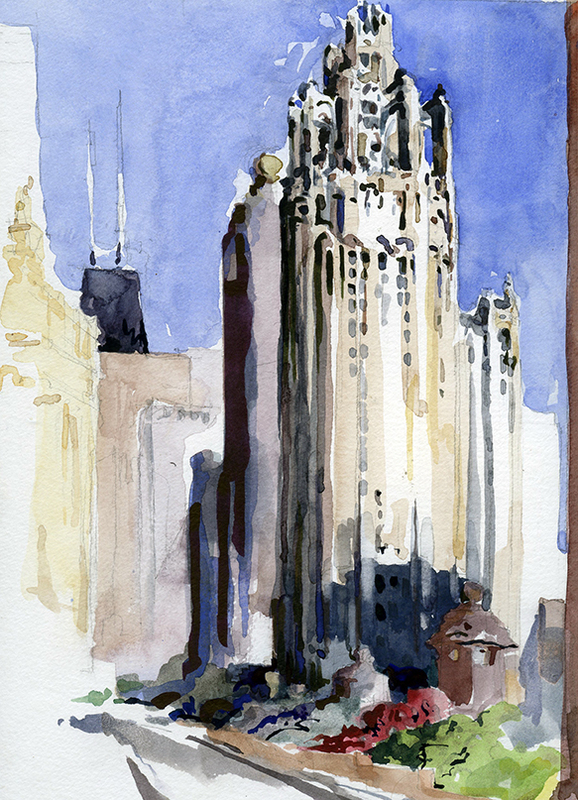 It is a sketch of an icon of early modern architecture in Chicago … the Tribune Tower. It proved most difficult. The building is a soaring mass with an ornate gothic style top; it is so distinctive and so very impressive. 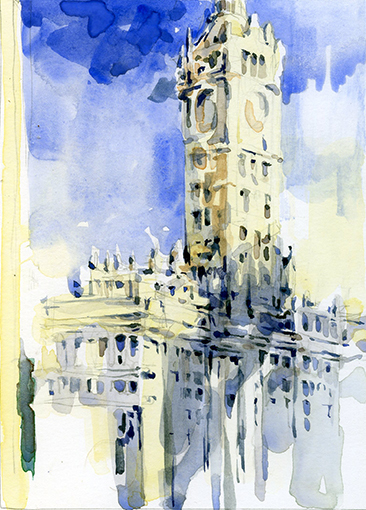 This sketch had big shoes to fill; it needed to feel solid and yet leap towards that intensely complicated and powerfully graceful beauty that graces the upper portion of the building. 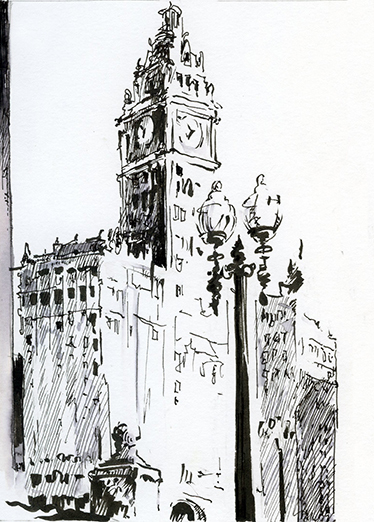 My sketch feels too overworked: I should probably have diminished the visual weight and attention it gave to the dark building immediately behind (to the left) of the Tribune. Those shadows along the road and bridge are a bit necessary to ground the building and were also real … but they also seem a bit heavy handed to me. I guess it an honest attempt … that just falls a bit short. Frankly, like trying to sketch the Tribune building, everything about the experience was SO very intense. There were many, many fine folks there; right at 500 or so talented and committed sketchers from all around the world. I worked with several great teachers and workshop leaders. Besides Lynne Chapman, I also had wonderful sessions with Uma Kelkar (the beauty of mystery) and Jane Blundell (she spoke on one of my favorite topics, the permanent watercolor pigments). And I got to meet some favorite artists, Marc Taro Holmes and Sheri Blaukopf … both hailing from Montreal. And I must not forget to mention the friendly, gracious, and magnificently helpful members of the Chicago Urban Sketchers chapter (including Paul Ingold) all of whom worked tirelessly as volunteers. We did make it home of course. And I have returned to sketching between and in the cities and towns near where I live. It feels really good to re-acquaint myself, to re-adjust, to be back into my more normal practice. And if I struggled a bit with the immense height that the central core of Chicago presented me with … my hope is that some of what I saw, did, and experienced in Chicago will rub off on my work as well as my teaching of sketching.